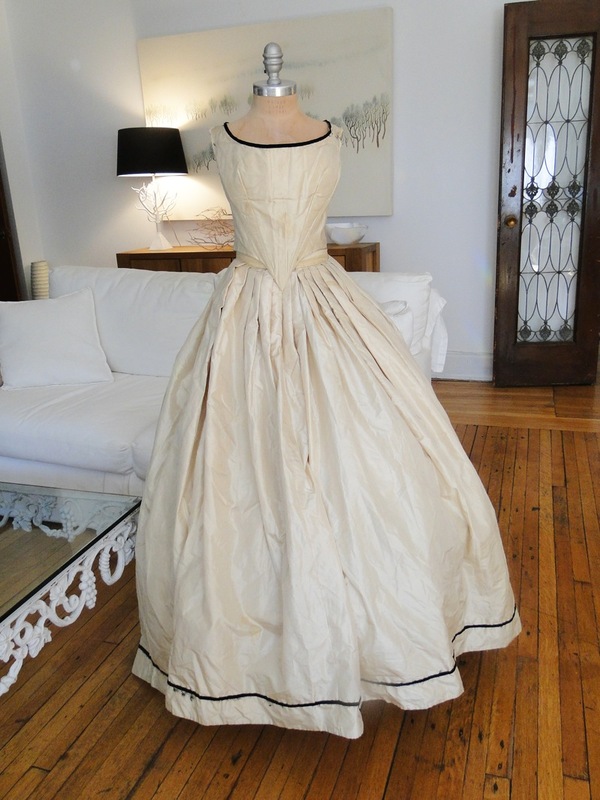 Circa 1860’s, a luminous cream silk bodice and skirt. The bodice has inner stays and hook and eyes and lacing holes at the back and is lined with a inner cream chintz with extra original padding under chest. 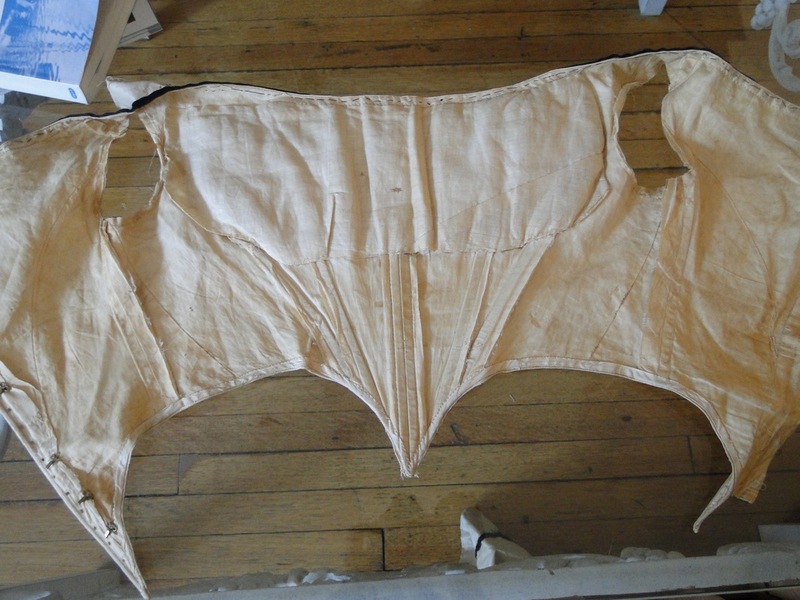 The skirt is quite voluminous, a lovely luminous cream silk with inner chintz lining . There is a black velvet trim around the neckline and bottom of the skirt. 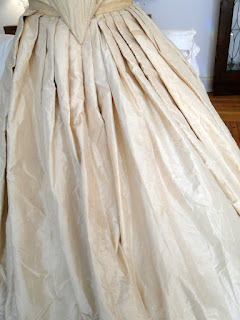 There was black lace which we have taken off because of damage on the lace… so black velvet ribbon is attractive against the cream silk, if collector desires they can always add lace.Measuring apprx.42” long for skirt , 24 1/2” around waist..Bodice measures apprx.14 1/2” across chest, 21-22” across waist area. 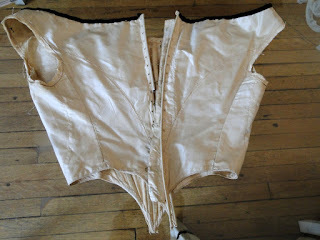 In very good strong condition.. NO WEAR, one small area on edge of bodice cord,minor.and a broken stay right near lacing holes, also missing laces..a few stains on inner chintz, silk has dirt marks on very edge , a couple of minor marks, just needs cleaning.Any remaining black threads from lace we will have removed… In all… NO WEAR……very good condition, needs only to be cleaned. The first thing I noticed, after the lack of sleeves, was that the skirt was displayed wrong. 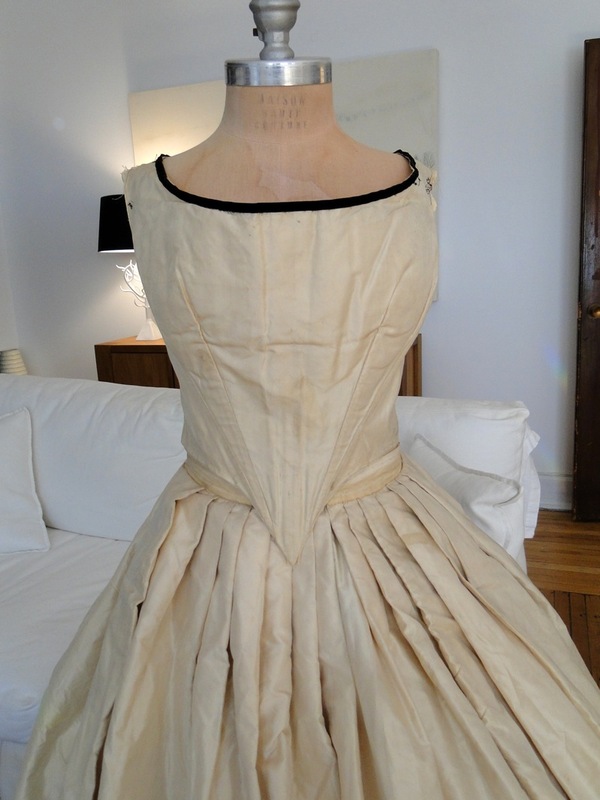 It's shown on it's side with the front to the left of the photo (right of the dress). You can tell based on the pleating and how badly the skirt wants to swish to the right of the photo. 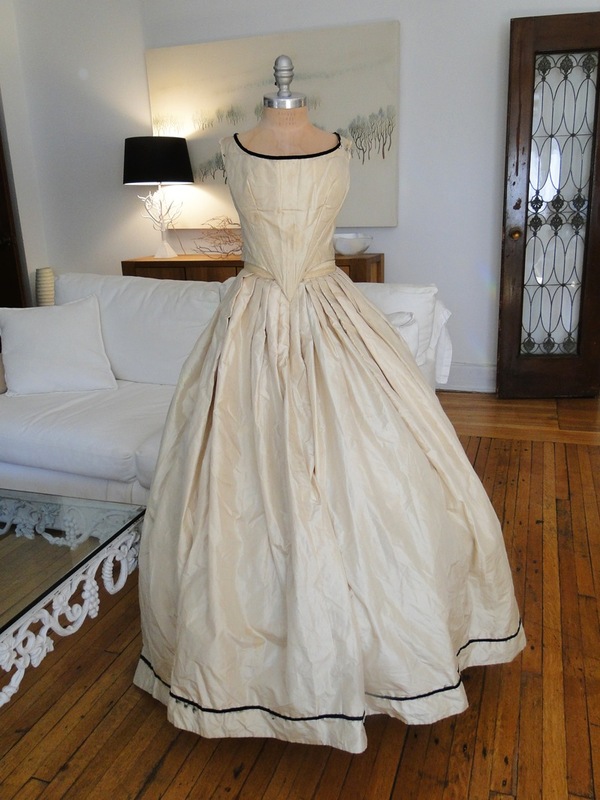 The point on the ballgown pretty much disappears by 1863/1864, so the dress is from before then. The lack of sleeves make it slightly harder to date - I'm sure some seamstress was trying to "improve" her dress to the latest fashion and it ended up lingering in the UFO pile forever- but I think it's probably about 1862/1863. 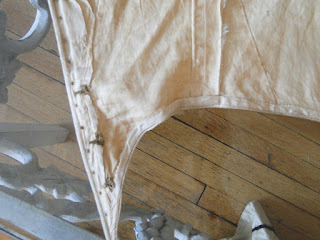 This might be another reason it was left to linger - the point was no longer fashionable by the time she got back around to fixing it. Notice the pleating on the fashion plate skirt compared to the extant skirt - the pleats move towards the back with a wide front and more pleats as you go back. 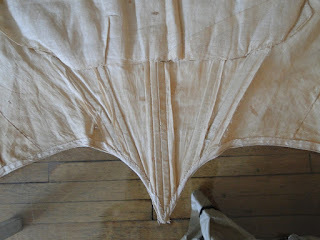 This was to add some "umph" to the back of the skirt. 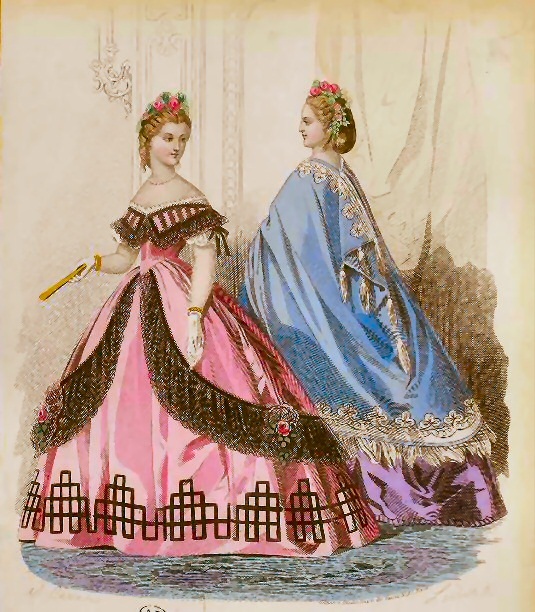 By 1863, you start to see very small early bustles; although they don't become a fashion necessity until about 1867/1868.